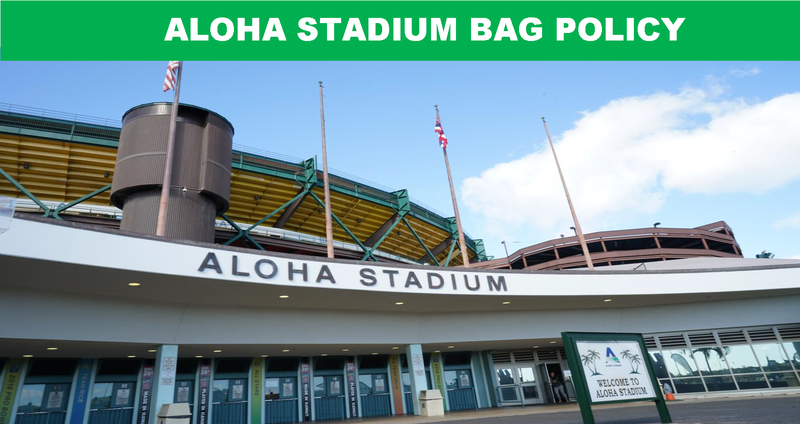 Why did Aloha Stadium update its bag policy? A: To provide a safer environment for the public and to expedite fan entry through the turnstile gates. Aloha Stadium management reviews public safety and security policies every year looking for ways to improve. This review includes a look at best practices from around the country as well as seeking advice from security experts from both State and Federal agencies. A. Each person shall be allowed one bag that does not exceed 12” x 6” x 12” in size. Do other Universities and stadiums implement similar practices? A. Yes. In the past 3-5 years most universities and almost all professional sports stadiums have implemented similar, or even more stringent bag policies. Some larger universities, such as the University of Michigan, Michigan State and Penn State do not permit any bags into their stadiums. How does this policy benefit the fan? A. One benefit of this policy is that fans will spend less time in line trying to enter through the turnstile gate. With fewer bags allowed, the security bag check will be expedited and fans will be able to get to their seats more quickly. A. Each person is allowed one bag, not to exceed 12” x 6” x 12” in size. In addition, fans can hand carry a blanket, jacket/poncho and a soft-sided seat cushion. Can fans carry cameras, binoculars, smart phones or tablets separately from what they put in their bag? A. Yes. These items can all be hand carried into the stadium, but should not be in a separate bag or carrying case. Are seat cushions allowed into the stadium? A. Only a soft sided seat cushion the size of the seat is allowed into the stadium. Large seat cushions that have pockets, zippers, compartments or covers are not permitted. A. Yes. Fans can bring blankets by carrying them in hand or over a shoulder or arm. A. Fans carrying bags that do not meet the criteria will be turned away. Our parking attendants will do their best to stop fans in route to the turnstile gates to educate them about the policy and encourage them to return the items to their vehicle. What do I do if I have medically necessary items? A. We do make exceptions for medically necessary items after proper inspection. If you prefer, you can contact Stadium Security in advance of your visit at: 483-2804. A. We allow one extra bag for baby items, including diapers, baby food, bottles, etc. Bag size will not be restricted to a 12” x 6” x 12” for this bag, but the bag will be visually inspected. A. Yes, strollers are allowed, but they must be collapsible and able to fit beneath the seat without blocking the aisle. Are you requiring the Clear bag? A. No. Although many other venues require the use of a clear bag, our policy only restricts the size and quantity of bags, but does not require a clear bag. Why are we doing this in Hawaii when we haven’t experienced any mass casualty events before? A. Unfortunately mass casualty events have occurred at stadiums/arenas across the world in recent years. It is the responsibility of stadium management to implement the necessary precautions to prevent such an occurrence. In that effort, Aloha Stadium continues to stay informed about security best practices and will continue to adopt policies and procedures that optimize safety. Non-approved bags must be returned to vehicle or discarded. An exception will be made for medically necessary items after proper inspection. Please limit the number of items you bring to the stadium on event days.